Everyone can relate to a particular piece of music in their life. There are wedding songs, tunes a band played for slow dancing at the prom, and millions of love ballads for broken hearts and the lovesick. Each of these may point to a specific moment, event, or meaningful portion of a person’s years and serve as a page-holder in time. For me, there is a particular book I relate to in the same way. From my childhood, I recalled a volume my father kept on his bookshelf. This one stood out from the rest; bible-black, and roughly the size of an encyclopedia, the cover told only part of the tale. 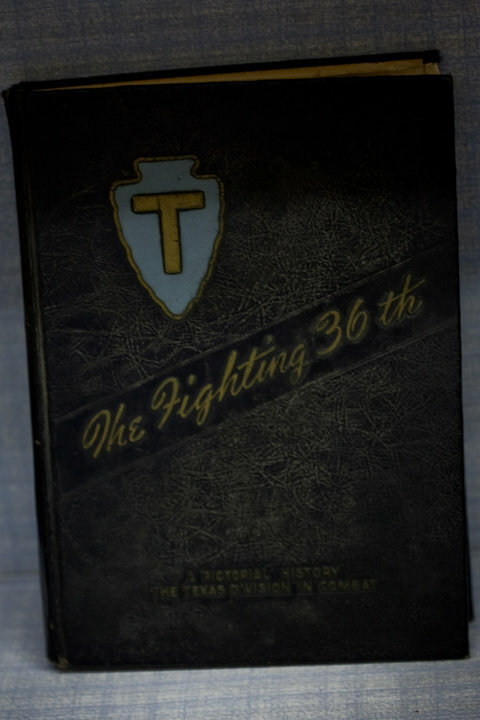 This was a bound collection of news articles which chronicled the exploits of the “Texas” 36th Division in World War II. The light blue “T” patch of the unit was emblazoned on the front. At the age of eighteen, he was assigned to the division and served in Italy. While I was in elementary school, I understood little about war, but was enthralled by the knowledge that my father was a soldier. As he scanned the book for the names of his buddies, I was unaware of the pain and horror its accounts and pictures described. The men my father fought alongside all died shortly after he was wounded in battle. Everyone who served in the 36th Division during the war is listed in the back pages. Next to the names of the dead – my father’s pals – are tiny pencil marks; simple recognition that each man meant something to him. My dad remained tight-lipped about his war exploits until shortly before his death. Somehow, he summoned the nerve to confront his memories and stare down their intrinsic awfulness. Over the last few years, I gradually heard tales of where he fought and how he was wounded. In the end, I sense that he felt relief after finally describing the actions leading up to his injuries: his near-death experience, almost being buried alive, and escaping the torpedoes of a German u-boat while aboard a ship headed for home. Upon hearing his revelations, I shared a bond with him, a new level of confidence, as he softly recounted battle after battle. He trusted me to carry these details, to convey them to my children one day as a lesson in perseverance; though, he was too modest to suggest as much. After his death in May, 2009, my siblings and I began the cheerless mission of closing our parents’ home. It was during those days when I remembered that somewhere within the walls of their residence remained that book which captivated me for over forty years. It took me two days to search through the hundreds of hard covers, fiction titles, and coffee table books my parents owned. Eventually, I tracked it down to a book case in an upstairs bedroom. If one could touch an antique and be transported to the period when it was relevant, I came as close to that possibility as one might believe when I reached for its dusty jacket. Holding that historical object was like grasping a length of rope tethered to an ancient remembrance. This book was seared into my psyche as a symbolic artifact of my father’s extraordinary second-self – his war record. Rooted in my earliest recollections, it was akin to a holy relic, something to be venerated. Yet, there it was in my adult hands; and, I was ready to comprehend its significance with a fresh, mature perspective. This book retains a value that is greater than the paper and print it consists of. My own history is adhered to its binding. The sudden reappearance of this memoir cannot be overstated. In the same way a song may render both sorrow and joy in a survivor’s heart, I embrace my inheritance; bible-black and with the names of the dead within, I mourn my father’s passing, and still feel his love. 'My own history is adhered to its binding. 'Thank you for sharing such a personal story, it's wonderful. It's so important to keep these memories alive. And you especially seem to have an honest, knowing heart. Thanks Kathleen, I am keeping the memory alive for my children. They miss their Grandpa. -Mike. I enjoyed your essay. I, too, have the same book, actually 2 copies. I purchased a copy because I couldn't find the one which I'd looked at as a child. Then, I found my father's copy. Inside was an artillery overlay of the battle for which my father and his lifelong friend were the only survivors. Thanks of reading and I am glad you liked my essay. I would imagine there are a lot of copies of this book floating around. 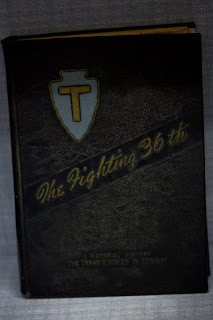 It's an interesting read, and there is plenty of information on the 36th Division's website too. Thanks again.